Another shout out to Shizznizzle for posting about the free shipping. 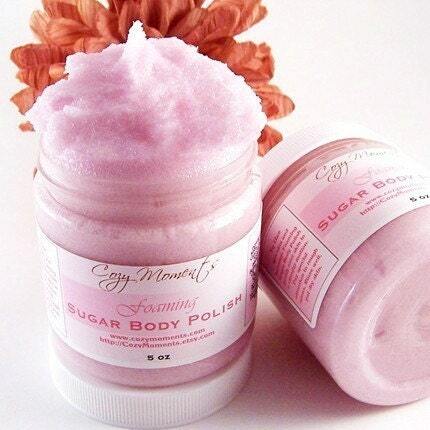 Cozy Moments is a seller on Etsy who does the handmade body products - the ones that look like cake frosting. Yummy! I have never purchased from there, but I just picked up the Coconut Cream Foaming Bath Cream and the Black Raspberry Sugar Scrub. The prices are very reasonable, so go check it out. Most of the ingredients are good, but there are a few body creams that contain Parabens, so be sure to read the ingredients! From the website: USA and Canada orders ship FOR FREE – no matter how much you buy! No lines. No crowds. No worries. Shop all you want and we’ll ship it to you for free via USPS First Class or Priority Mail. All other international orders ship for ½ off! Sale begins at 12:00 am November 28, 2008 and runs until Monday, December 1, 2008 at midnight. *Sale cannot be combined with any other discounts. :D yum! pls review Black Raspberry Sugar Scrub, and hope you like your order!